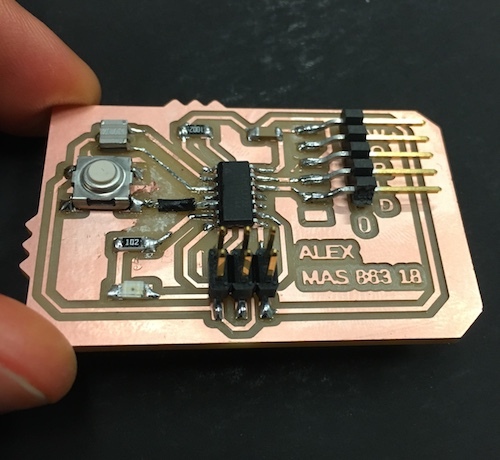 In a previous week, we designed and milled a PCB, and then stuffed it with an ATtiny44, a button, light, a capacitor, resistors, and other components. 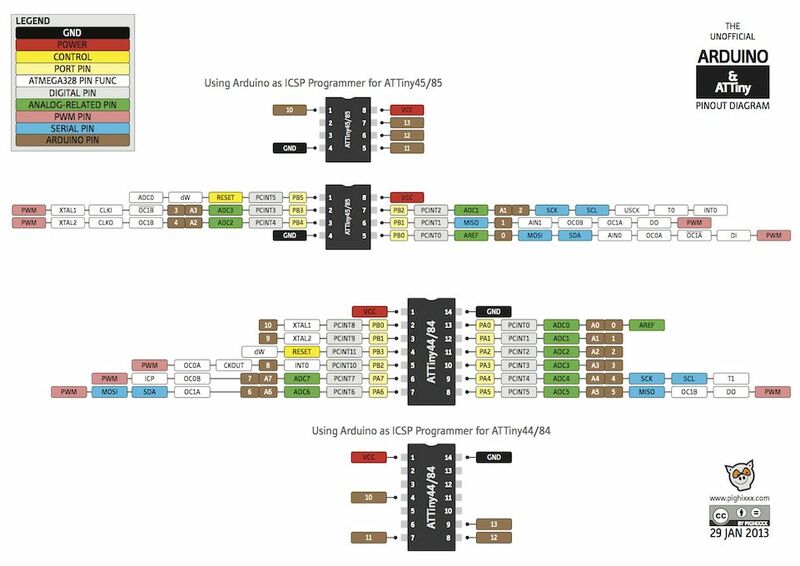 Read the datasheet for the ATtiny44 microcontroller & program the microcontroller to make the board do things. 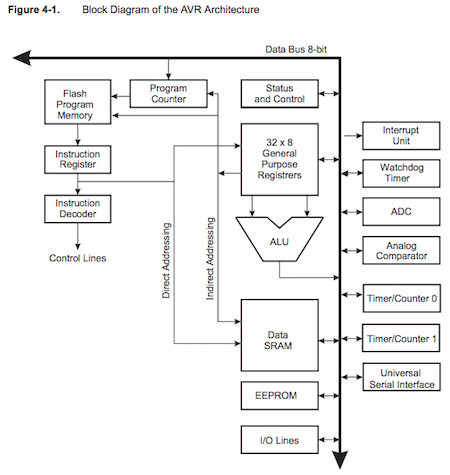 and then zoom into subsections of the architecture, such as the CPU Core. 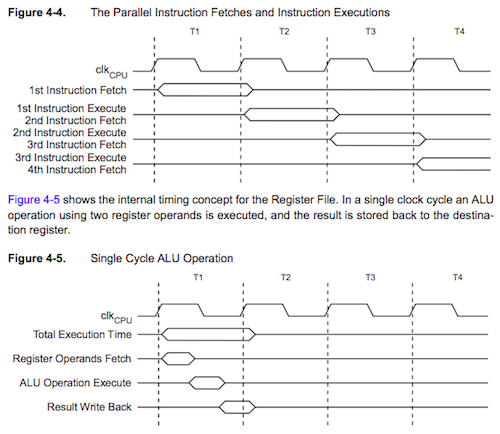 The timing of these parallel processes is later diagrammed in section 4.6. 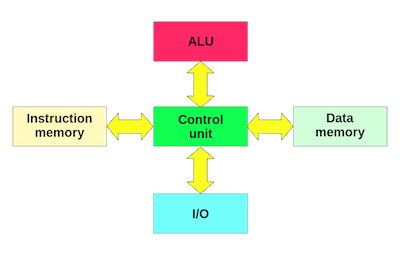 Similarly, the other subsections of section 4 describe the details of the CPU’s other core parts. 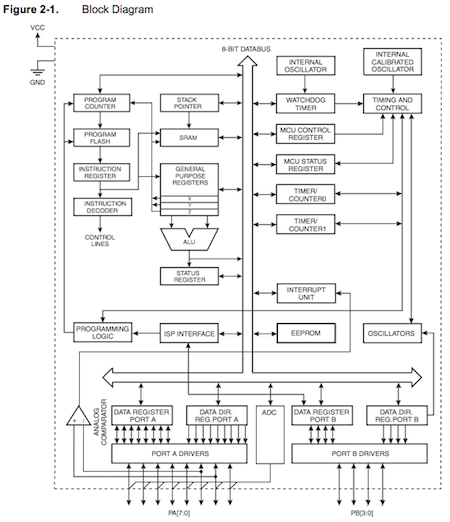 After reading each of these subsections, you can squint at the diagram of the CPU core and see how it fits with the most basic diagram of the Harvard architecture. This was my first time doing embedded programming, so I wanted to work my way up from arduino basics to a proper C program. 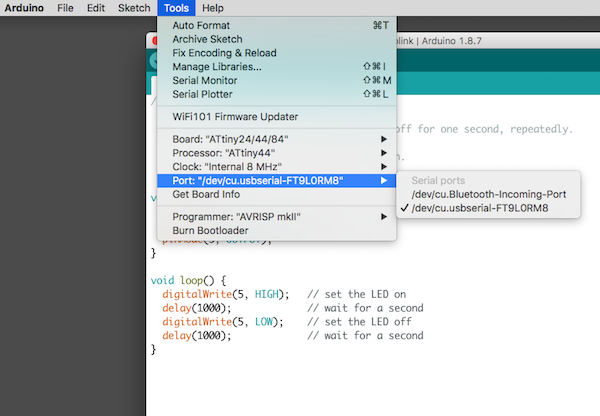 I downloaded Arduino on my mac. 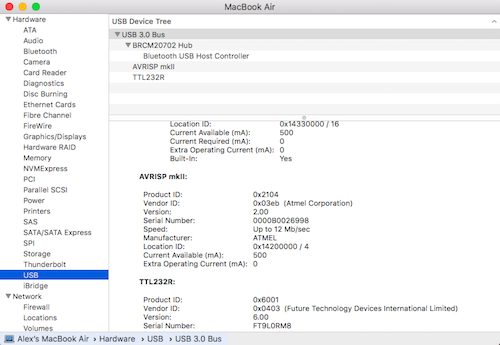 I connected my board to my computer with the AVRISP programmer I found in the FabLab, and a USB cable. 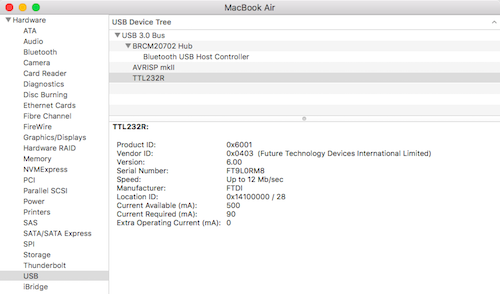 I confirmed that the programmer I was using is the AVRISP mkII by plugging the device into my computer and finding it in the hardware > USB section of my mac’s device tree. Even though I know I attached a 20mHz resonator to my board, I selected Clock: Internal 8 MHz. 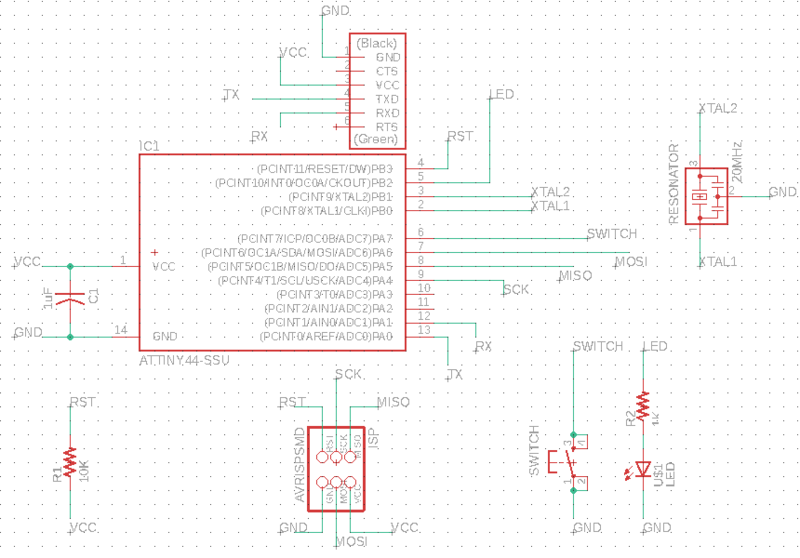 I referred back to the schematic of my board to figure out which pins to set up. I modified Neil’s supplied blink code for Arduino (http://academy.cba.mit.edu/classes/embedded_programming/Blink.pde) to use the right pin and then did Burn Bootloader to load the code. The next step was to get my button to trigger the action of the LED. The action would be saying “HELLO WORLD” in morse code. Morse code is composed of “dots” vs “dashes” or long vs short pulsations of a light. Hello world is .... . .-.. .-.. --- .-- --- .-. .-.. -..
Now to return to the basic software I am most comfortable with: Text editors and terminals. 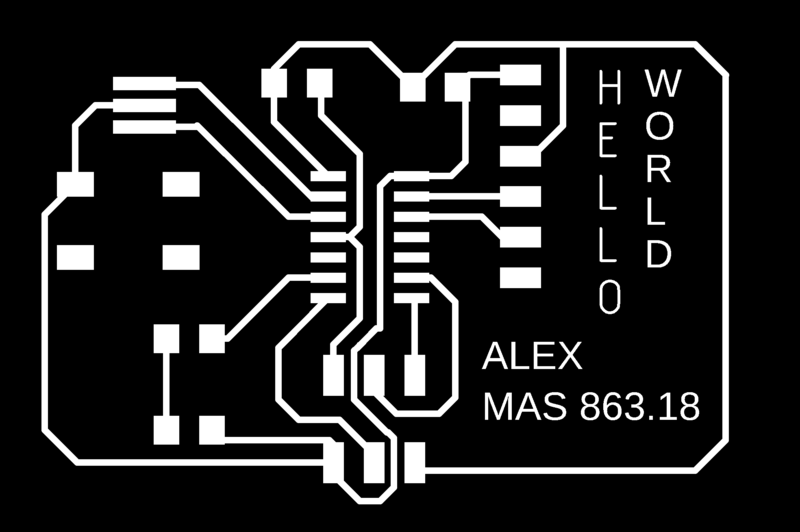 I started with Neil’s provided echo C code (hello.ftdi.44.echo.c), and modified it to use my LED and switch to say HELLO WORLD in morse code. I also reused the makefile provided by Neil, modifying the project name. (Note: I am using the avrisp2 as my programmer).